Tuxedo vests are a total throwback to the 90s and are in dire need of a comeback! They add a sense of medieval spiffiness reminiscent of Robin Hood charm. I purchased mine light years ago at a warehouse sale in the industrial ghettos of Downtown LA. The building was tagged with graffiti and looked despondently abandoned. Its desolate appearance was beguiling as on the inside, rows upon rows of irregular size treasures discounted up to 80% off retail were being devoured by a packed house of savvy shoppers. Sadly, the brands featured in the sale are now completely defunct. I miss going to these chaotic shopping events. Nothing beats the serotonin rush of digging and striking gold at a warehouse sale. I wore this outfit on a very productive shopping trip at American Rag, one of my favorite boutiques in LA. The La Brea Blvd shop is uniquely LA as it houses an impressive collection of contemporary favorites like A.Wang, Commes des Garcon, and Dolce Vita as well as an eclectic selection of overpriced vintage. After my AMEX had its fun, I headed over to the Palihouse to attend a Wet n Wild Beauty party. Juicy sliders, soft chocolate chip cookies, exciting conversations with the WNW team, and unrestricted access to makeup made Jenny a very happy girl. What a fabulous night. I don't want to say too much but I promise GBF is about to get a bit more wild! Great look, great blog...Grazi for the giveaway! I love that vest! Great outfit! I like the vest and the shoes! !Would you like to follow each other?Let me know! I totally love your look. The dress is so nice. I was looking for a brazier exactly like this. Нi therе to everу body, it's my first pay a visit of this web site; this blog consists of awesome and in fact good material for visitors. Amazing outfit! And gorgeous pictures! :) Beautiful!!! 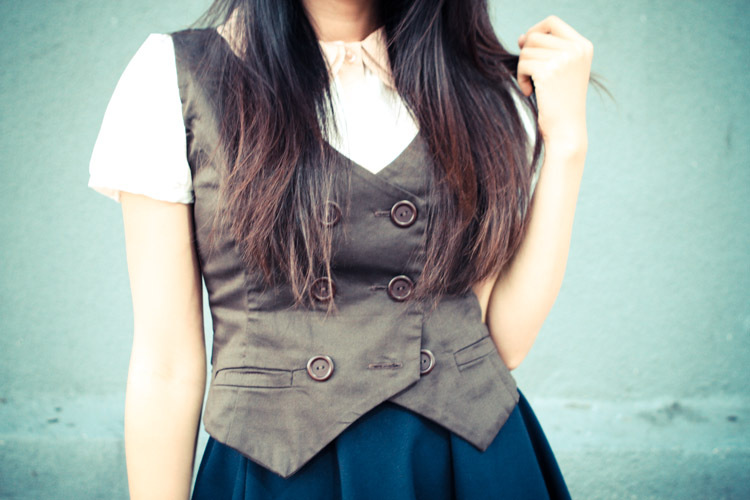 love your outfit, the vest and the skirt are gorgeous! We absolutely love the skirt and you in it! I adore your skirt. Thought it was two skirts layering at first. Beautiful outfit for my Valentine's Day featuring on my blog. See details at the bottom. Love this look on you. Gorgeous look! I love the velvet skirt and emerald looks beautiful on you. Hi jennie !!! Thanks for the lovely comment you left on by blog !!!! Your blog is simply stunning, and your style gorgeous !!! I decided to follow you because of this ! If you like to follow me back your welcome and I'll be happy ! I did all three requests. you are so flawless! Love all the little layers peepin out in this outfit. You must have the best job in the world :) love your blog!